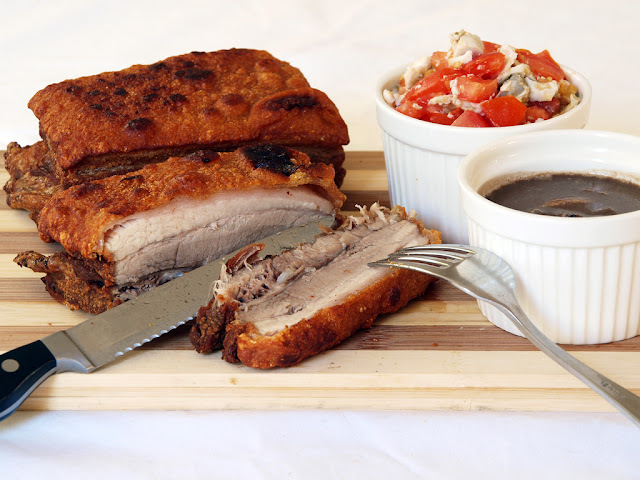 The Bagnet or deep fried pork belly with blistered skin is a must-try Ilocano dish. Bagnet is the Ilocano version of Lechon Kawali. It is a choice cuts from pigs side, belly or liempo. Ilocanos prefers kamatis and lasuna (garlic) with bagoong nga munamon (fermented anchovies) to go with this mouth-watering dish. 1 In a stock pot, bring water to a boil with added salt. Drop pork and boil until tender. Drain and hang dry, then set aside. 2 Submerge the pork in hot cooking oil until brown. Drain and dry in paper towel until completely cool. 3 Reheat cooking oil. Submerge the pork in very hot cooking oil for while, strain, and sprinkle with cold water. 4 Do this process several times until skin pops. Remove from fire and serve.